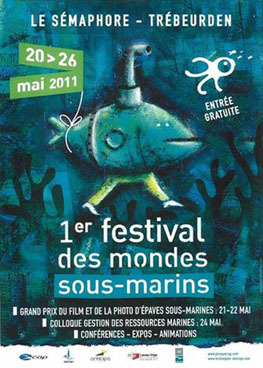 This year, the city of Trébeurden created the event with the first edition of the Underwater Worlds Festival which took place from 20 till 26 May. Sponsored by Pierre-Yves Cousteau, son of the famous French explorer, and organized by the dive center CAP Trébeurden, this demonstration had for originality to have been conceived around a concept introduced and piloted by Jacques Le-Lay, professional underwater cameraman. Innovative concept based on a unique theme : wrecks ! So, fascinated, simple curious or loving of the sea were able to roam in the paths of this original festival and to discover the fascinating world of wrecks, real immersed heritage emphasized by exhibitions of photos, paintings, dive equipment, projections of movies and documentaries, conferences and presence of numerous participants, all well-konwn by this middle. Children were for the honor with displays of drawings but also with the participation of two of them in the jury which chaired Jean-Louis Maurette, representing L'Expédition Scyllias. Accompanied him several professionals of the press as Paul Poivert (Octopus) and Daniel Deflorin (Plongée mag), of the broadcasting with the TV journalist Guénaëlle Théaud, the edition with Patrick David (éditions du Bout du Monde), without forgetting famous wrecks amateurs such as René Tamarelle, wreckhunter and founding member of Corsaires d'Ango and Daniel Blin, chairman of the F.F.E.S.S.M. departmental committee in Morbihan and talented photographer. Competitions were dedicated, naturally, to wrecks with various formulae. Left : Jean-Louis Maurette, chairman of this first edition, during the inaugural speech. 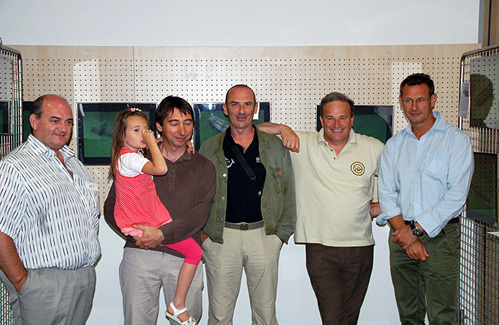 Right : a part of the jury posing in front of Olivier Brichet's paints (l to r): Paul Poivert, Olivier Brichet, Jean-Louis Maurette, René Tamarelle and Jacques Le-Lay. A festival already international as the special prize of the jury was granted to the Canadian Nathalie Nasselin for its full-length film JB King whereas the first prize of the short movie went to the Hungarian Gyulia Somogyl for The ships of Darkness with, at the end of it all, of numerous prizes for all the winners. 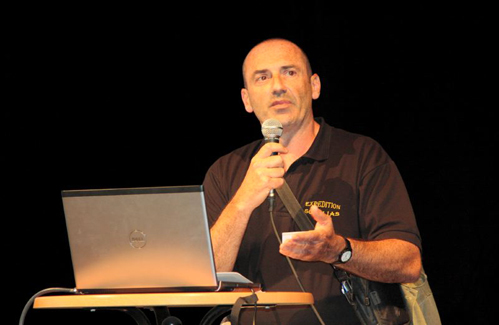 Participants and speakers were able to share their passion and their experiences with a wide conquered public who appreciated the numerous subjects approached, such as the plane of Saint-Exupéry or Titanic, other ones usefull because treating, in particular, techniques of submarine shots, or singular and fascinating such as U-Boote. The Underwater Worlds Festival of Trébeurden showed itself as high as the expectations of its organizers. A success and the opportunity to discover new talents. Meeting is taken for the second edition ! 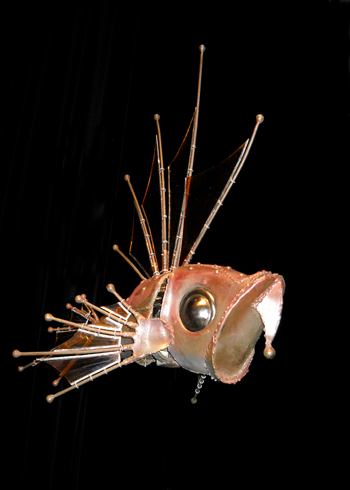 Metallic fish, sculpture exposed during the festival, by Alain Brouard.